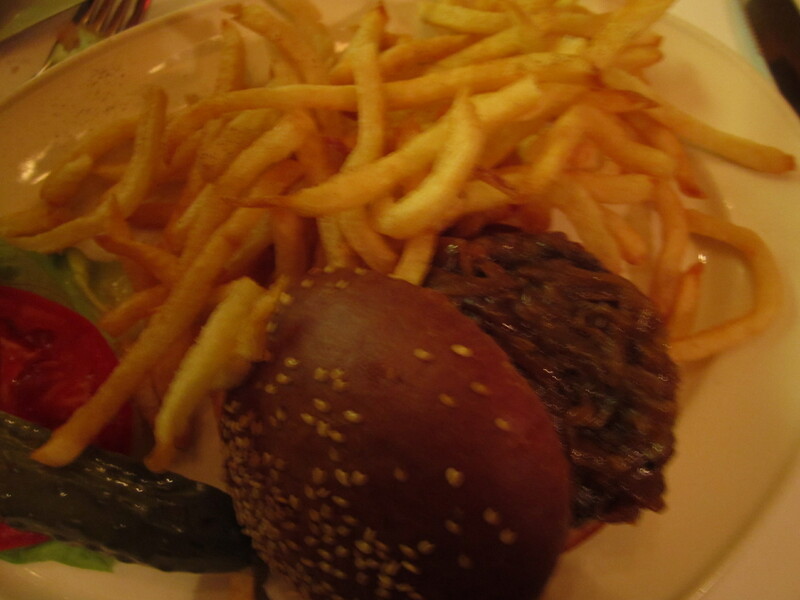 At last, I had the opportunity to try the Black Label Burger at scenetacular Minetta Tavern. Reservations can be made only one month in advance of your desired date to dine. We wanted August 18 at 7:30 PM. D called on July 18 and could only get 7:00 PM. Yes, that’s how popular Minetta Tavern is. The Black Label Burger is delicious. Black pepper seared into the meat, the carmelized onions on top, the buttery bun it sits between. The burger is less fatty and so, less flavorful in the conventional burger flavor sense (think Shake Shack). No cheese, no condiments. I consumed it as one should. I felt the an understated highlight of the plate was the fries, which are crisp, thin McDonald’s-style potatoes. 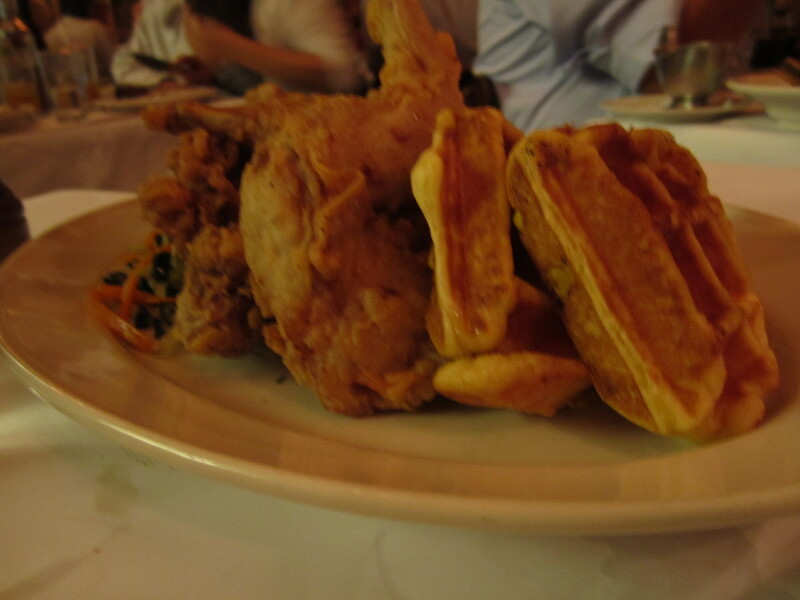 What impressed me the most was our appetizer, southern fried rabbit legs with waffles. This wasn’t on the menu but, when I saw plates of it glide by us, I felt we had to try this special appetizer. The rabbit legs were covered in juicy, slightly tangy bits of meat under perfectly golden fried breading. And the waffles! Corn kernels dotted the batter resulting in a subtly sweet companion to the rabbit. Yum. When we arrived, we were relegated to the busy bar for about 15 minutes before our table was ready. Well-dressed, fine (white) people bustled around us, shaking people’s hands, exchanging false pleasantries with the hostesses. It was if some of them had stepped out of Vogue magazine. The hostess led us to our table, a corner booth with minimal space to breathe but likely the most private seats in the cramped house. There I noticed people who were denizens of Ralph Lauren ads, J.Crew catalog, Golf News magazine. To return, I’d likely have to coax myself by celebrating a major milestone there. I’d like to try the Minetta Burger, so, perhaps that milestone will come sooner rather than later.